Gapers Block - To be Demolished: 1948 N. Burling St. Permit Description: Wreck and remove a 3-story brick single-family home and garage. As is increasingly the norm in the area, this orange-rated Italianate residential building is being demolished with its neighbor to the north, 1950 N. Burling St. A new multi-million dollar residence will be built in their place. No 311 calls or other recent permits have been placed regarding this residence. Additional details about the neighborhood and its major new construction projects are available in the 1950 N. Burling St. entry. The Chicago Historic Resources Survey is the city's effort to assess the importance of all pre-1940 buildings in the city. "Red" and "Orange" rated buildings are subject to a "demolition hold" of up to 90 days to explore alternatives to demolition. A building's "Status" is updated to "Released" when demolition of the building is allowed. 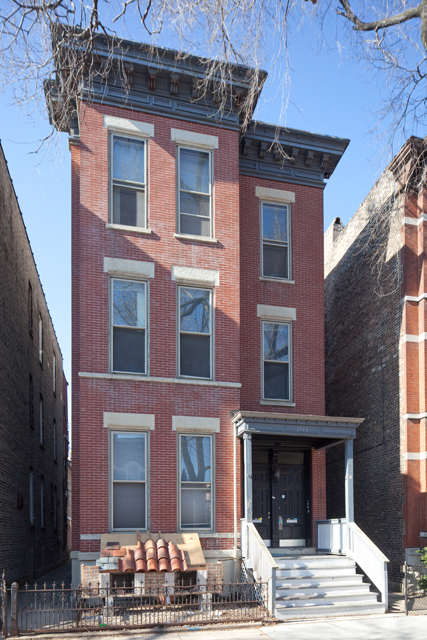 RED properties possess some architectural feature or historical association that made them potentially significant in the broader context of the City of Chicago, the State of Illinois, or the United States of America. About 300 properties are categorized as "Red" in the CHRS. ORANGE properties possess some architectural feature or historical association that made them potentially significant in the context of the surrounding community. About 9,600 properties are categorized as "Orange" in the CHRS. The Fast Track Abatement Program avoids the court process by allowing the city to repair or demolish buildings three stories or shorter that are "vacant, open, and constitute a hazard to the community." Visit the full background information section for more definitions, resources and information about the project. Over the course of 2012 David Schalliol produced a photographic portrait of 100 of the hundreds of buildings threatened with demolition in the city of Chicago. Nearly all of the buildings have since been demolished. Visit the background information section for more information about the project, including definitions and links to other building resources. The series is supported by a generous grant from the Richard H. Driehaus Foundation.